Sightings are pretty much the most important thing on FindALostPet. Any member of the service can post an image and location of any lost pet they see… once they’ve scrolled through a list of pets that are known to already be lost nearby and found which one they think it is. But this scrolling was a bit of an issue in our eyes. Who wants to have to figure out which of the dozens of lost pets nearby the one you’re seeing right now is, especially as it’s currently running across the street to lie down under a parked car! No, this needed some work. So we built another way to post sightings. Instead of a button for each pet (which we have decided to keep, as it’s useful if you’re already 100% certain), there’s one, simple button at the top: Post a Sighting. This button brings up a little post a sighting box that asks for an image of the pet and for you to confirm the sighting location, just like the others. It’s just as simple for the user, and almost the same. The real magic happens behind the scenes. 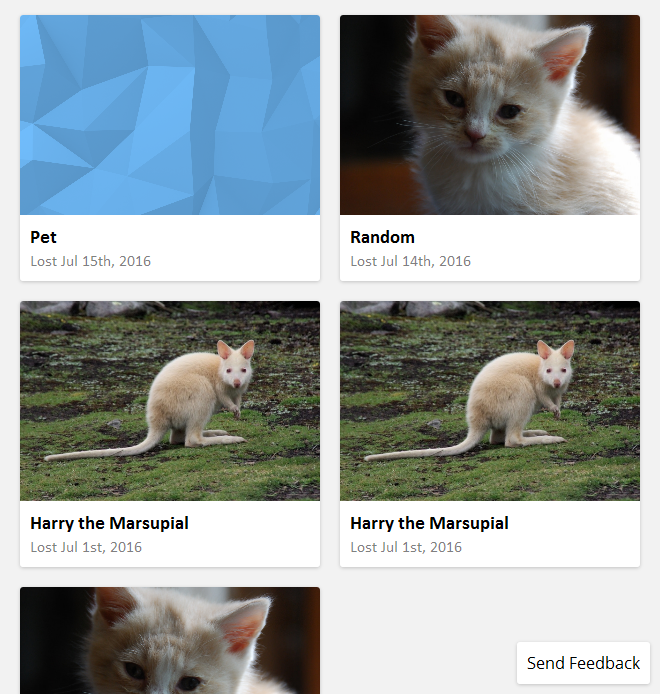 Before we released FindALostPet a couple weeks ago, we had started playing around with an AI-based image recognition service called Clarifai. We originally only used it to detect adult content in images, so as to prevent people defacing the website, but soon we realised that we might as well take it further. So now, when you upload a sighting on FindALostPet, the system takes a look at the images you’ve uploaded with it and sends them to Clarifai. Clarifai tags the species of pet in the photo and sends that back to us. Our system then routes the sighting to all owners of lost pets of the same species within a five kilometre radius. Pretty neat! But it gets better. Before, the lost pet you saw on the street would already have to be posted to FindALostPet for you to do anything about it, but not anymore. You can post a sighting whether or not the pet is already on the service, then if the owner does post the pet, they’ll immediately get access to the sightings reported beforehand. Even neater! So next time you see a lost pet on the street, feel free to try this out. Just click the big Post a Sighting button at the top of the home-screen! Awesome artificial intelligence software will do the rest. As always, we look forward to any advice, thoughts, suggestions or bugs you may have. Just email us at theteam@findalostpet.org! Oh, and if you’re not on FindALostPet yet (unfortunately you do need an account to post sightings and pets), you can sign up here. It takes less than thirty seconds (ten seconds if you’re quick! ).